Fabius Maximus has a guest post on Climate Etc. in which he focuses on RCP8.5. RCP8.5 is a Representative Concentration Pathway (RCP) that leads to a change in forcing of 8.5Wm-2 in 2100. Focusing on this particular RCP seems to be a bit of a theme at the moment. There appears to be two basic arguments. Those who describe RCP8.5 as business as usual (BAU) are wrong (and probably activists), and we should be assigning probabilities to the emission pathways associated with the various RCPs. As far as referring to RCP8.5 as BAU, I don’t particularly care. It just seems to be an argument about terminology. I’d rather engage with what someone is intending to say, than with some pedantic interpretation of the words they’ve used. If someone defines BAU as a pathway in which fossil fuels continue to dominate, and in which emissions continue to increase, then that seems reasonable to me. If someone wants to define it differently, I don’t have a problem with that as long as the definition is clear. However, assigning probabilities to the emission pathways associated with the different RCPs seems more problematic. Technically, the RCPs are concentration pathways that are used as input to climate models (GCMs). The models are then used to estimate what will happen if we follow such a concentration pathway. However, we can’t say with certainty what will happen (different models, for example, produce different climate sensitivities) and so each RCP is associated with a range of outcomes – for example, warming in 2100. Each concentration pathway is then associated with an emission pathway. Even here there are uncertainties associated with carbon cycle feedbacks, and so we can’t even necessarily associate, precisely, an emission pathway with a concentration pathway. So, ultimately there are a range of possible outomes for each concentration/emission pathway. That, however, doesn’t mean that we should also associate a probability with each emission pathway specifically; in the sense of representing the chance that we would actually follow such a pathway. 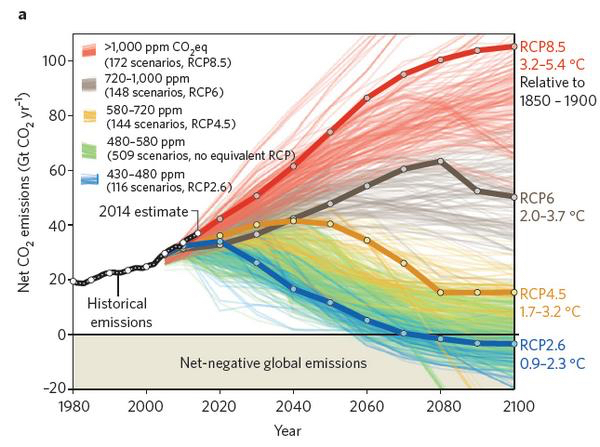 The reason, as Nick Stokes points out, is that these emission pathways are essentially scenarios. We can consider various different scenarios and the impact of each scenario. This can then be used to inform policy making. It’s of course true that not each future emission pathway is equally likely, but we’re not going to follow one by chance alone; we can influence what emission pathway we actually follow. At any instant in time, we can estimate how much we’ve already emitted, our current emissions, and (based on the different scenarios) if we should be doing something to influence future emissions. It may be extremely difficult to follow some future pathways, but that doesn’t mean that we can’t try to do so (unless it becomes actually impossible, that is). Also, the chance of following a particular pathway probably changes with time. It’s clearly becoming more and more difficult to follow a low emission pathway, given what we’ve already emitted. It may also be getting more and more unlikely that we’ll follow a high emission pathway, given our current understanding. That, however, doesn’t mean we should simply leave not doing so to chance. Of course, understanding different emission pathways, and the potential impacts of the different pathways, is an important part of decision making, but ultimately we will determine what pathway we’ll actually follow. We’re extracting the fossil fuels and burning them. This isn’t happening by chance. I guess one could argue that some emission pathways are virtually impossible and should, therefore, be ignored. However, maybe those who think that RCP8.5 is one such pathway, and that describing it as business as usual is wrong, should ponder the figure on the left. It certainly seems like business as usual at the moment. Also, if such a pathway is now virtually impossible, then it should be pretty straightforward to simply avoid following it, especially if doing so does presents risks that we might want to avoid. This entry was posted in Climate change, Climate sensitivity, ClimateBall, IPCC, Science and tagged Climate change, Emission pathways, Fabius Maximus, RCP8.5, RCPs, Representative Concentration Pathways. Bookmark the permalink. 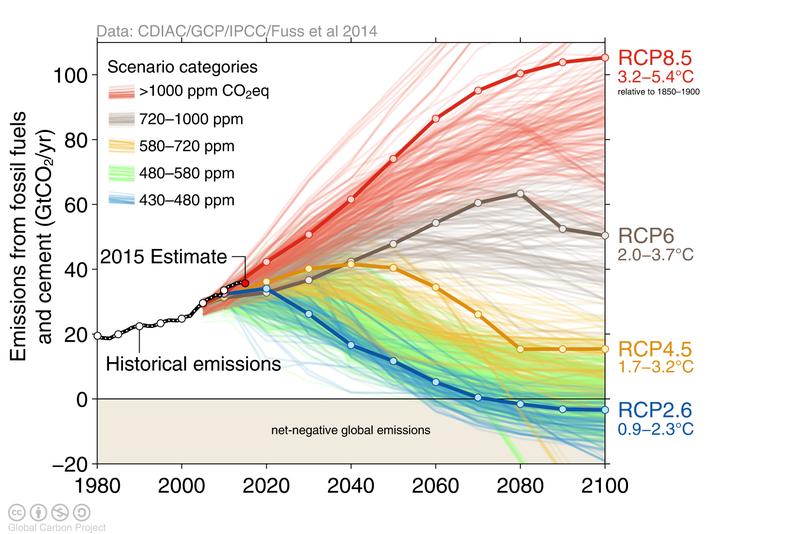 We could alternatively call RCP8.5 the mitigation sceptical scenario or the CO2-is-life scenario. Then let them explain why RCP8.5 is not their dream scenario. Except for being too expensive because the costs of renewable energy go down so fast. I am still not sure why, when we appear to be closer to 8.5, which is supposedly the high end, that everything else is lower ? Shouldn’t 8.5 be about the middle if that’s the trajectory we’re on ? with a 10.5, 12 etal 2.6 seems like a very low possibility, then why not 15 equally ? I saying that I have to confess that I think the Paris outcome was a much worse outcome than Copenhagen. I am also the only person I know living a low emissions existence (about 2.5t CO2 and looking to trim that to 2t) so I have some idea of what’s involved and why getting there is impossible. As an experiment, try and halve your emissions for a year and then figure out how out halve them agaIn and then again and for many, again. My eyes are on the Mauna Loa CO2 graph. I think it’s because energy projections suggest that it would be hard to follow an emission pathway that would produce a greater change in radiative forcing than 8.5W/m^2 by 2100. Bear in mind that RCP8.5 continues increasing beyond 2100. A caveat, however, is that uncertainties in carbon cycle feedbacks means that we could potentially follow what we think is a lower emission pathway and still end up with a change in forcing of around 8.5W/m^2 in 2100. So, I guess that implies that what we think of as a RCP8.5 emission pathway could still lead to a greater than 8.5W/m^2 change in radiative forcing by 2100. I saying that I have to confess that I think the Paris outcome was a much worse outcome than Copenhagen. I think this depends on how you measure it. Relative to how bad it could have been, it was quite impressive. Relative to what we might have hoped, it was poor. At the end of the day, we are where we are, and we have to live with that. If you want to defend RCP8.5 “because it looks right” I’ll grab a ruler and extrapolate sea level rise to be 30 cm, then I’ll extrapolate temperature rise to an additional 0.8 degree C by the end of the 21st century. This renders all your proposals fairly meaningless. This isn’t what I said, is it? Also, I’m not actually defending it. I’m pointing out that it is a scenario. We have control over whether or not we actually follow it. That’s the key point. I’ll grab a ruler and extrapolate sea level rise to be 30 cm, then I’ll extrapolate temperature rise to an additional 0.8 degree C by the end of the 21st century. And you’d be illustrating your ignorance if you did so. Here’s the crucial point. How much sea level rises, and how much we warm is set by physics. There are certainly uncertainties, but the amount of sea level rise and the amount of warming for a given emission pathway is something over which we have no control. The emission pathway itself, though, we do have control over – in the sense that we can influence what it will actually be. That’s the key point. RCP8.5 may indeed be very unlikely for many reasons. However, that isn’t – IMO – an argument against being aware of what would happen if we did follow such a pathway. Also, one of the reasons it’s getting more and more unlikely is because of our understanding of what would happen if we did follow it. The argument against RCP8.5 seems to be a little like a situation in which – once you understand the risks associated with a particular scenario – you then go and criticise all of those who, earlier, were pointing out these risks. Something to bear in mind is that almost all the RCPs assume increasing energy use. The reason that some follow pathways with reducing emissions is because of the development of techology like CCS, or the implementation of alternatives. I guess it’s possible that this could simply happen by chance, but there are many who think that we should be actively trying to develop such technologies and alternatives, not simply sitting back and assuming that it will happen by magic. I’ve always thought of 8.5 as, ‘carrying on as we always done with no regard for carbon emissions’, so ‘business-as-usual’ seems to be perfectly good shorthand. To change it, or it’s name, because it now seems an implausible trajectory, will just confuse things—which is perhaps the objective of those lobbying for such a change. To change it, or it’s name, because it now seems an implausible trajectory, will just confuse things—which is perhaps the objective of those lobbying for such a change. Well, yes, that’s my general impression. They’re trying to cast it as people presenting information that is wrong, and – hence – disingenuous. Of course, the irony is that the same people don’t trust climate model projections, but seem to think that their views of what we will do in future are somehow facts. In the usual tortured language of climate, I think pathways, storylines and scenarios are being confused. One serious mistake that many people seem to make is in equating the “low”, “medium”, and “high” emissions scenarios with “low”, “medium”, and “high” risk of serious damage. This is absolutely not the case, and over the long term (that is, over centuries/millennia) any emission scenario over a “low” level will in fact have profoundly serious ecological sequelæ for humans and for the planet’s biodiversity. …and ~10% chance of exceeding 4 °C. These are Bad Numbers. Anything that doesn’t come close to RCP 3.0 is effectively a failure to protect our civilisation and our global biodiversity’s intregrity. I agree. We tend to ignore that even the lower emission pathways don’t rule out significant warming. We also tend to ignore that uncertainties about carbon cycle feedbacks could mean that a lower emission pathway could produce a higher concentration pathway. Of course, there’s the possibility of it going the other way too, but as Richard Alley says (paraphrasing) most of the uncertainty is on the bad side. ATTP, IP2C was discredited at COP21. People have listened to Hansen. Bernie wants a carbon tax. I don’t get to vote, but I agree that a carbon tax is the right step. Sorry, I didn’t mean to be cryptic. I just think the IPCC scenarios are overly complicated. Hansen reduced the whole AGW issue to 22 pages plus 259 references in “Assessing Dangerous Climate Change”. His mitigation scenarios reduce to one money shot with about 3 choices which diverge mostly depending on when we decide we’ve had enough CO2. The possibilities for mitigation are greatly constrained by identifying three indispensable strategies: a carbon tax, economic/virtuous CO2 drawdown, and encouragement of nuclear technology to fill the gap of power generation that renewables cannot yet provide for. Eventually the people of the world are going to recognize these constraints/potentialities. It’s our job as scientists/intellectuals to hasten the world towards these goals. I think we’re wasting our time focusing on over-complicated science “summaries”. As the engineers say, for good reason, Keep It Simple! Sorry, I didn’t mean to be cryptic. I just think the IPCC scenarios are overly complicated. I tend to agree. That’s why the whole cumulative emission picture is quite useful. If we know how much we’ve already emitted and have an estimated carbon budget, then we have an idea of how much we have left. That then gives us an idea of what sort of emission pathway to be aiming for. If we know how much we’ve already emitted and have an estimated carbon budget, then we have an idea of how much we have left. Yup. That’s the essential math done in Hansen’s paper. I think more attention should be paid to Hansen’s proposed mitigation tools: examining the carbon tax concept and validating its premises — it’s a simple idea with very complicated implications; the issues surrounding nuclear technologies; and same for biosphere CO2 drawdown. I’ve obviously only read the abstract, but it would seem to be suggesting that we can’t rule out that we’ll continue to follow a high emission (RCP8.5?) pathway and that the strategies we’d need to employ to follow some of the lower emission pathways are potentially unrealistic (correct me, or clarify, if you wish). If so, that would seem somewhat at odds with those who argue that calling it a BAU pathway is fundamentally wrong. I’m also not sure if you’re suggesting that your paper is somehow at odds with what I’m suggesting here. Irrespective of whether or not it will be possible in reality to follow a particular pathway, the RCP runs still give us information as to what would happen if we did. Hence, they are still scenarios that provide information. It’s up to others (policy makers, for example) to decide if we should try to influence what pathway we do follow, in addition to the possibility of future developments that may influence what pathway we follow. Paris would not mean much if we cannot rule it out. I thnk the new low carbon future is coming. II – Thou shalt raise concerns about scientific vocabulary. The social sciences are notoriously loose in their terms. […] Everybody has physics envy, but is unwilling to accept the necessary discipline. An epilogue on how scientists ought to do their thing always provides a nice touch. RCP8.5 emissions grow at about 2% until 2060 and then the growth rate declines to zero in 2100. The historical norm is 2% as is the average for the last 30 years and the last decade. No wonder RCP8.5 is regarded as BAU since it matches a future scenario to the way we have behaved in the past and are behaving now. I don’t know about scientific vocabulary, but he seems to have some trouble leaving all the words in the bits he chooses to quote. I’d rather engage with what someone is intending to say, than with some pedantic interpretation of the words they’ve used. Ah, but then the deniers would have nothing to argue against, would they? After all, they have no actual case against either the reality of AGW or the value of mitigation, do they? III – Thou shallt parse and parse until nothing you read makes sense. If that practice were adopted widely, blogospheric discussions would dry up overnight. The question I always have about the carbon tax is how do you figure out how much. Depending on your discount rate and the fictional form of your damages equation, assumptions about future technology and so on, you can pretty much end up wherever you like within a few orders of magnitude. It’s pretty tunable. Also, a carbon tax would actually be a carbon price. A very capitalistic solution, ironically. It is, which – I agree – is somewhat ironic. My own view is that something in the double figures would be a reasonable start and better than nothing. Citizens Climate Lobby recommends starting at $10 or $15 per tonne of Carbon, rising $10 per year to $115. British Columbia started at $10/TCO2, the equivalent of $36/TC and raised it $5 per year to its present rate of $30/$110. Canadian dollars. You can’t really say what the price of carbon SHOULD be. What are its costs to society? The IMF estimated it at 5 trillion dollars per year. What is the price of global indundation of coastlines and an ungovernable world? What you need is a price that will level the playing field and guarantee a transition away from fossil fuels, while maintaining economic stability, thus the gradual phase-in. It’s mostly based on simple logic and intuition plus some modeling studies and economic analyses. Results have looked good in Australia and British Columbia, but it’s a very small sample base. I’m not an economic theorist but I believe there’s a difference between “free markets” and “capitalism”. Socialism is not antithetical to free markets. Richard Wolff is a compelling lecturer. The video I linked above is as good as any of his but more is better than one. He would have been happy with an FDR world (top tax rate was 94%, corporations contributed $1.50 vs $1.00 from individuals. Compare to now $1.00 from individuals to $0.25 from corporations) if it didn’t deteriorate in the decades since to essentially what we had prior to the great depression. His solution is “democracy in the workplace”. Workers own the company. By law. Workers hire and fire the managers. Workers are not going to move the enterprise to China because they would lose their jobs. Duh! They’re not going to pollute the community because they live there. His big example is Mondragon Corporation in Spain. Worker owned enterprises is a studied phenomenon in economics. At Mondragon the greatest pay-disparity is 8.5:1. In the US it’s 40 times that, etc. The graph you post that shows that CO2 emissions are more consistent with the RCP 8.5 path compared to the other RCP paths doesn’t indicate that RCP 8.5 is likely. What could be the case is that the other RCPs are terrible at predicting CO2 emissions over the first 2 decades and after that RCP 8.5 is terrible. If anything, such a graph mostly shows that all the RCPs are probably terrible and if anything the current RCP approach should be abandoned. Starting with a concentration pathway and then working backwards to find an emission scenario that corresponds to that pathway makes no sense. 2. A current mitigation pathway (i.e. under the level of mitigation that is expected given the pledges by various countries). 3. An optimal mitigation pathway (i.e. that which maximizes some social welfare function). 4. An optimal mitigation pathway that aims for a 2 C target. 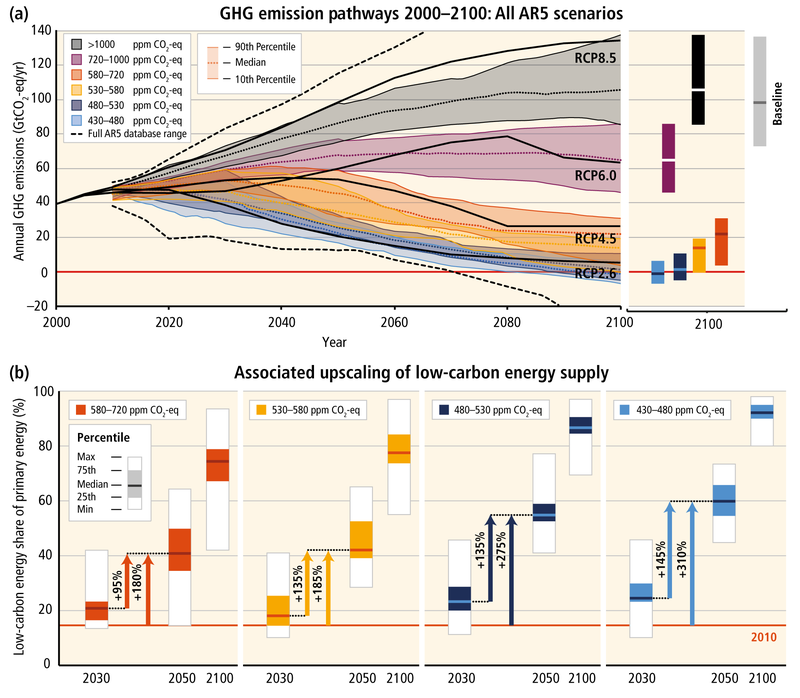 William Nordhaus’ DICE integrated Assessment model could help determine all 4 of these emission scenarios and then pathways that correspond to them could be determined. Regarding a carbon tax the way I think it should work is to start low to start so you barely notice it the first year. Then increase year by year so it becomes noticeable after 2 or 3 years and keeps growing until in 25 or 30 years it becomes high enough to be prohibitive of the use of net carbon emitting fuels. I also like returning the proceeds directly to taxpayers in even shares rewarding the carbon thrifty and punishing the carbon profligate. The graph you post that shows that CO2 emissions are more consistent with the RCP 8.5 path compared to the other RCP paths doesn’t indicate that RCP 8.5 is likely. I didn’t say it was likely (you did read the post, didn’t you). I was simply highlighting where we are. Given where we are, it’s hard to see why it’s justifiable to claim that RCP8.5 is definitely not a BAU pathway. How is this any different to what we have? Essentially this is what we have, especially as it is pretty straightforward to interpolate between the different pathways. – A sudden large break in the historic trend of the gradual reduction in the CO2 emissions / real GDP ratio. – Insane methane emissions that will result in a doubling of methane levels over the next 100 years for no good reason. Yes. The current RCPs don’t cover any of the 4 scenarios I mentioned. Yes, but that’s the future. Anyone who claims that they can state with certainty what will happen in the future is kidding themselves. My point is not that we will follow an RCP8.5 pathway, but simply that – given where we are now – it seems okay to describe it as BAU, as long as one is clear as to how that’s been defined. I’m not saying that we should, but that all the claims that it definitely isn’t seem rather weak. Except you can use the 4 RCPs to inform almost any reasonable pathway one might design. So, if someone comes up with a different pathway, it’s not that hard to estimate what will happen along that pathway. I guess the one caveat to the above would be if you wanted to design a pathway that had a large temperature overshoot, and then significant negative emissions. Ignoring that significant negative emissions might be a physical impossibility, something the current RCPs don’t tell us is how the system will respond to a large change in forcing that is then artificially reduced. No, but you can make predictions about what is expected given available empirical evidence and construct confidence intervals. Using a pathway which is like at the upperbound of the 99.9999999999% confidence interval of business as usual seems ridiculous. No it’s not okay, because that is misleading and from how many journalists and even scientific studies have described RCP 8.5, it creates a lot of misinformation. In this case, can I construct a BAU scenario where in 2050 the flying spaghetti monster suddenly appears and devours the sun? In which case global temperatures will plummet and I can call that BAU? Or is that ridiculous because there is no evidence of a flying spaghetti monster? A realistic BAU scenario is slightly above RCP 6.0 (and RCP 6.0 has it’s own problems, such as unrealistic exponential increase in emissions from 2030-2080 http://judithcurry.com/2015/11/30/how-sensitive-is-global-temperature-to-cumulative-co2-emissions/#comment-748504). Look, I’m not interesting in arguing about BAU and whether or not it’s appropriate. It’s simply words people use to describe something. My extremely simple point is that one can see why some might describe RCP8.5 as a BAU pathway. Explaining why it is unlikely, doesn’t change that extremely basic point. It’s the pathway we’re currently on. Until such time as that changes, arguments against calling it BAU are going to be weak. When you become emperor of the universe you can decide what’s okay and what isn’t. Until such time, others can make up their own minds. My own view, is that those who object are trying to control the narrative for their own purposes. This is ironic, given that the criticism is often based on others using BAU to suit their narrative. Hence – IMO – complaining about the use of the term BAU is as misleading as what you claim those who using it are doing. The following is an extract of a talk given to mark the 20th anniversary of the founding of the Romanian section of the Club of Rome. The extract has, I think, some relevance to the discussion here. “What we are celebrating today, however, is not the memory of past glories. What we are celebrating, instead, is the growing realization of how important and how modern was the vision that appeared in the first report to the Club, the very famous book titled “The Limits to Growth”. Today, more than 40 years later, I had the honor to sign as the main author the 33rd report to the Club; a book titled “Plundering the Planet.” With this book, we re-examined several of the scenarios and the concept of the 1972 report. We found how consistently the ideas of the early report were on target and how closely the world’s economy has followed the scenario that was defined as “base case” and that today we would define as “business as usual”. It is a scenario that sees the growth of the world’s economy maintained up to the first decades of the 21st century, to be followed by a stasis and then by rapid decline. RCP8.5 population growth is clearly consistent with current projections for the century. That’s not true of any other RCP scenario. Methane levels doubled over the past century. Maybe we’re insane. Using a pathway which is like at the upperbound of the 99.9999999999% confidence interval of business as usual seems ridiculous. RCP8.5 and RCP6.0 are at the upper and lower bound of “baseline” – i.e. no policy scenarios – up to 2100. The median of baseline scenarios is half way between the two. That makes perfect sense to me in exploring possible outcomes. > [Y]ou can make predictions about what is expected given available empirical evidence and construct confidence intervals. AR5 WGIII (Adaptation and Mitigation) needed to estimate the costs of mitigation, and that can’t be done without having a reference point of zero mitigation. For that, a plausible range of baseline scenarios is needed; a single high-end baseline scenario wouldn’t do. AR5 WGIII uses the ensemble of business-as-usual scenarios that have been published by independent investigators. While those are associated with a wide range of total emissions, most are clustered between the RCP8.5 and RCP6.0 scenarios by the year 2100, with the exception of scenarios that explicitly assume very rapid gains of technological efficiency. What would not be OK would be to present 8.5 as the “best estimate,” the “central value” of all the scenarios. Which is not what is being done with 8.5 – that’s what “conservative” means in that context. NG’s central estimate is 3C, BTW – why does Willard Tony present him so lukewarmingly? > In this case, can I construct a BAU scenario where in 2050 the flying spaghetti monster suddenly appears and devours the sun? Your own opinion of climate sensitivity, likely world economic development, etc., may differ from the middle-of-the-road consensus values, especially if you think you’re smarter than a typical climate scientist. Here is a question: Given that the RCPs are representative concentration pathways and then people look backwards to find emission scenarios that correspond to them, and given that you think probability isn’t a big deal when describing a scenario as BAU or not, then couldn’t you describe all of the RCPs as BAU scenarios? Like you could construct a highly unlikely emission scenario that is BAU and corresponds to RCP 2.6. So therefore, RCP 2.6 is BAU? No, actually RCP 8.5 has the least consistent population projection. http://judithcurry.com/2015/12/13/a-closer-look-at-scenario-rcp8-5/ Though admittedly it isn’t that bad compared to the other RCP 8.5 issues. And an additional doubling doesn’t follow current trends. Methane levels should roughly plateau. Then why isn’t RCP 6.0 also described as BAU, especially by the media? and given that you think probability isn’t a big deal when describing a scenario as BAU or not, then couldn’t you describe all of the RCPs as BAU scenarios? If you define what you mean clearly, then you can probably call them whatever you like. You might have a hard time convincing people that business as usual is rapid emission cuts, though. What % of the American public? It would be interesting to see a search to get a breakdown of where it has been mentioned. My guess is that it is more prevalent in technical scientific literature than in mainstream media (or discussions among politicians), by orders of magnitude. Perhaps your concerns about how many people have been mislead by the use of Business as Usual in reference to RCP 8.5 are a tad…um…..(I don’t want to say alarmist)….er….overstated? Really, what does climate science tell us about likely world economic values? and its also economics.. and demographics, and best of all it predicts new technology. You will note that none of the objections folks raise about RCP8.5 hinge on ECS. > Really, what does climate science tell us about likely world economic values? Climate science can show us scenarios regarding some of them. You will note that rhetorical questions can backfire when they get answered. [MOC] Why isn’t RCP 6.0 also described as BAU, especially by the media? The obvious answer is: because RCP 8.5 shows one of the worst case scenarios. A less obvious answer might be: it’s a rational thing to do in risk analysis. I suppose the latter answer is less obvious because of the popularity of the lukewarm playbook. Another answer could be: it’s how the media works. The media can also work the other way around: see how most of the populist rags minimize AGW. Hyper-rationality is seldom very rational. Very little. But the majority have probably read at least 1 misleading article that was based on a scientific paper that used RCP 8.5. Yeah, because in the mainstream media, they dumb it down by calling it business as usual. Thus describing it as BAU misleads the public. If you take the worst case of the 95% CI for predictions of population growth, and do that for expectations about the change in the GDP/CO2 ratio, and do that for expectations about future growth in GDP per capita, and do that for climate sensitivity, and do that for CO2 uptake, and do that for the rate at which we reach equilibrium, and do that for methane emissions, and do that for N2O emissions, and do that for the discount rate, and do that for the climate damages function, and do that for the abatement cost function, and do that for sea level rise, etc. Pretty soon you are basing decisions on a scenario that has a p-value of like 0.05^12 = 2.4 x 10^-16. Things get absurd pretty quickly. A better approach to decision making under uncertainty is http://judithcurry.com/2015/11/29/decision-making-under-uncertainty-maximize-expected-social-welfare/. No, actually RCP 8.5 has the least consistent population projection. Median is 11.2 billion at 2100. 80% range is 10 – 12.5 billion. RCP8.5 is the only scenario within this range. Why should they? What are “current” trends? Why isn’t the past century a “current trend”? > Thus describing it as BAU misleads the public. Not at all: 8.5 could very well be one of the worst case scenarios. You might very well get one of the worse case scenarios. > Things get absurd pretty quickly. Things can get absurd pretty slowly too. Take this ClimateBall ™ exchange. 1. tropospheric methane has a very fast decay time (like 9-12 years) so methane levels are roughly proportional to methane emissions. 2. Most methane emissions are from land use, specifically you have things like agriculture. And the population is going to plateau mid century. 3. If you look at trends in methane, the increase has slowed down greatly in recent years. Climate science tells us nothing about likely world economic development. Economics would do that. and then imagine that I told you that economics was telling us something about climate science. Then he would be right. but he misspoke. pretty effin simple. Maybe, but a quick use of The Google even for BAU returns waaaay more hits for climate warrior blogs than for mainstream media. I found two mainstream hits in the first 10 pages of a “BAU” search, and both references the term to describe risk from current level of emissions. Is that a problem? …I’m not sure…but even with that, it seems that your concern may be over-stated. In my experience, climate combatants often lose sight of how much they’re focused on a bubble. That’s not a problem per se, but it becomes problematic when they lose sight of that when projecting outward to the impact of what goes on inside that bubble to the larger public context. Compared to the broader integrated assessment literature, the RCP8.5 represents thus a scenario with high global population and intermediate development in terms of total GDP (Fig. 4). Per capita income, however, stays at comparatively low levels of about 20,000 US $2005 in the long term (2100), which is considerably below the median of the scenario literature. Another important characteristic of the RCP8.5 scenario is its relatively slow improvement in primary energy intensity of 0.5% per year over the course of the century. This trend reflects the storyline assumption of slow technological change. Energy intensity improvement rates are thus well below historical average (about 1% per year between 1940 and 2000). Compared to the scenario literature RCP8.5 depicts thus a relatively conservative business as usual case with low income, high population and high energy demand due to only modest improvements in energy intensity (Fig. 4). In other words, RCP 8.5 explores a scenario void of Gnomic Grrrowth Gimmick , where most of the world remain as poor as today, where cheap carbon gets dumped into the atmosphere like there’s no tomorrow, but where fossil fuel continuance does not necessarily mean a complete lack of technological progress. Donald’s Dream come true. Figure 4 comparing 8.5 with the AR4 database should suffice to show why that scenario was developed. I think it’s best to keep misinformation to a minimum, and RCP 8.5 does appear to be creating a fair amount of misinformation for the public. I haven’t kept track of the journal articles that arguably cause misinformation due to RCP 8.5 (maybe I should start), but I have certainly seen a fair amount on sites like CBC, BBC and the Guardian. And the result is that it gets misrepresented or misinterpreted, which causes misinformation. RCP 8.5 is problematic. > Climate science tells us nothing about likely world economic development. NG would agree. What he said only implies that climate science creates projections based on some likely economic developments they picked up from economists. In other words, NG’s joke works by assuming that you can outplay climate scientists by picking up a more likely economic development, not that climate scientists are the ones who develop what’s the most likely economic development. OTOH, the “likely” may assume a probabilistic interpretation of scenarios, something not everyone accept. I’ll ask him to delete that “likely.” His “middle-of-the-road consensus values” also has an ambiguous scope. NG might need to clarify his joke. > Economics would do that. IV – Thou shalt compartimentalize knowledge and create an angelology of expertise. > And the result is that it gets misrepresented or misinterpreted, which causes misinformation. Because it’s void of Gnomic Grrrowth Gimmick? > RCP 8.5 is problematic. OT: not that RCP 8.5 is boring, but this one is interesting. More confirmation of Hay sea level paper. ==> “I think it’s best to keep misinformation to a minimum, and RCP 8.5 does appear to be creating a fair amount of misinformation for the public. Minimum misinformation is good, misinformation is sub-optimal,for sure, but where is your evidence about RCP 8.5 “creating” a “fair amount of misinformation?” I mean of course, “fair amount’ is subjective, but where is your evidence of any sort? It would seem to me that to judge “misinformation” you have to first explain how you’re going to define the state of being “misinformed,” and then provide evidence of “the public” having reached that state, show causality therein, and then evaluate the size of that group relative to the larger public. That’s what I meant about the bubble. People in the bubble are easily convinced on these kinds of issues w/o, at least it seems to me, evidence or data to justify their certainty. It would take me quite some time to collect all the evidence to demonstrate this; time I’d rather not spend at the moment. Maybe it would be quicker for you to go to the Judith Curry Blog Post and ask people in the comment section for some examples of RCP 8.5 being misrepresented. This statement is based on RCP 8.5, but is described to the public as ‘current trajectory’. It describes RCP 8.5 as what is expected under no mitigation. Even the abstract of scientific papers are misleading and this was published in nature. Sounds like that would be quite expensive and you would have to hire a bunch of social scientists to test this. Yes, confirmation bias is an issue. -1, I see no confusion over RCP 8.5 other than the confusion you’re trying to sew. Its just a scenario that we are currently adhering to, and it gives a clear idea about what will happen if we continue to do it. I’d be interested in knowing what your best guess for a global emission path we’re most likely to follow. i think it would be between RCP 8.5 and RCP 6. methane levels picked up right when mega-frac’ing started in 2006–they can use like a 100 rail cars full of proppant (sand) for these wells which if you think about is crazy. what has been over looked is the wasted amount of ingenuity, talent and money that has been spent on fossil fuel extraction; the intellectual effort on improving imaging algorithms for processing seismic data alone is staggering. if they could only spend this same effort on renewable energy we would be in a much better place. the technology and engineering involved with deep water drilling and production is amazing. Did you find that CBC article with a Google search? If so, what was your exact query? This was also true during the past century when methane levels doubled. Total population is not necessarily strongly determinative, but anyway a mid-century plateau is only a feature at the low end of current population projections. At the other end of the range 21st Century absolute population increase is about the same as 20th Century. Looking at AR5 Table 6.8 for methane sources, ‘Agriculture and Waste’ is indeed the primary anthropogenic contributor, with landfill and ruminants dominating that category. Will an increasing taste for meat in developing countries lead to greater ruminant emissions? The fossil fuel contribution is probably larger than either on an individual basis though. Yes, but to take anything predictive from this requires understanding the reason(s) for the slowdown. I’m not sure if this is well understood right now. The numbers in Table 6.8 seem to suggest the main factor has been an increase in oxidation by tropospheric hydroxyl radicals (OH), which is the dominant methane sink. That suggests, if OH oxidation returns to previous levels, we would see a resumption of fast methane growth rates, similar to those of the 20th Century. Running on the methane chart up to 2015 shows a continuation of the recent uptick, with some signs of acceleration, but too soon to say for sure. Seems to me that all the pearl clutching about RCP8.5 and BAU is simply people who don’t want others to highlight the risks associated with continuing to increase our emissions. > Even the abstract of scientific papers are misleading and this was published in nature. Growing evidence demonstrates that climatic conditions can have a profound impact on the functioning of modern human societies [1, 2], but effects on economic activity appear inconsistent. Fundamental productive elements of modern economies, such as workers and crops, exhibit highly non-linear responses to local temperature even in wealthy countries [3, 4]. In contrast, aggregate macroeconomic productivity of entire wealthy countries is reported not to respond to temperature , while poor countries respond only linearly [5, 6]. Resolving this conflict between micro and macro observations is critical to understanding the role of wealth in coupled human–natural systems [7, 8] and to anticipating the global impact of climate change [9, 10]. Here we unify these seemingly contradictory results by accounting for non-linearity at the macro scale. We show that overall economic productivity is non-linear in temperature for all countries, with productivity peaking at an annual average temperature of 13 °C and declining strongly at higher temperatures. The relationship is globally generalizable, unchanged since 1960, and apparent for agricultural and non-agricultural activity in both rich and poor countries. These results provide the first evidence that economic activity in all regions is coupled to the global climate and establish a new empirical foundation for modelling economic loss in response to climate change [11, 12], with important implications. If future adaptation mimics past adaptation, unmitigated warming is expected to reshape the global economy by reducing average global incomes roughly 23% by 2100 and widening global income inequality, relative to scenarios without climate change. In contrast to prior estimates, expected global losses are approximately linear in global mean temperature, with median losses many times larger than leading models indicate. Do your own calculations lead you to see that “expected global losses are approximately linear in global mean temperature,” -1? > It describes RCP 8.5 as what is expected under no mitigation. We quantify the potential impact of warming on national and global incomes by combining our estimated non-linear response function with ‘business as usual’ scenarios (Representative Concentration Pathway (RCP)8.5) of future warming and different assumptions regarding future baseline economic and population growth22 (see Supplementary Information). This approach assumes future economies respond to temperature changes similarly to today’s economies—perhaps a reasonable assumption given the observed lack of adaptation during our 50-year sample. In 2100, we estimate that unmitigated climate change will make 77% of countries poorer in per capita terms than they would be without climate change. Climate change may make some countries poorer in the future than they are today, depending on what secular growth rates are assumed. With high baseline growth and unmitigated climate change (RCP8.5 and Shared Socio-economic Pathway (SSP)5; see Supplementary Information), we project that 5% of countries are poorer in 2100 than today (Fig. 3a), while with low growth, 43% are (SSP3; Fig. 3b). Your description of that paper might very well be misleading, -1. What -1 finds “absurd” is deemed “reasonable” by the authors. See? That’s how you create Inhofe cheeseburgers. So you don’t have solid evidence on which to base certain conclusions. Your concerns about a “fair amount” of misleading impact are entirely speculative. Let’s even substitute your later formulation of “a fair amount” for the “a lot” you used earlier….you seem to be making a certain determination of impact without evidence. And yet you seem to be expressing a significant amount of concern in that regard. Now I can’t parse the science well enough to know whether the projections of RCP 8.5 are realistic (within stated margins of error) given a continuation of current rates of emissions (assuming a range of sensitivity)… It seems to me that if your argument is a technical one, you should stick to that to make the case that there is analytical error in the projections of RCP 8.5. Personally, I think that more impactful (on public opinion) than “misinformation” about RCP 8.5 is when “skeptics” don’t have sufficient evidence to back up the certainty they express in their conclusions. But I recognize that (1) I don’t really have the evidence to be certain about that and, (2) I am very likely to be “motivated” in that regard because of the influence of my own ideological orientation. Here’s why I’ve focused on this here: I recently saw a comment of yours over at Judith’s crib where you spoke very disdainfully about “alarmists” corrupting science (paraphrasing in a general way, but I’m pretty sure I remember reference to “alarmists”). Now I don’t know if you’re an alarmist or not (given the generally accepted meaning of that term). I tend to think that you aren’t a “scare-monger” or a “Chicken Little.” But I think that you may have a double-standard as you evaluate the evidential basis on which people express concern related to climate change. There’s 2,795 GT in the world’s proven oil, coal and gas reserves and that’s enough to sail way past the emissions that create RCP8.5. So there’s absolutely no denying it’s possible and indeed to do so would be a dereliction of duty by the IPCC. If we manage to fall short of 8.5 it won’t be any thanks to the head-in-the-sand luckwarmers, ‘skeptics’ and -1’s of this world, who are doing everything they can to obfuscate. It will be down to the climate scientists and those alarmed by their evidence, who warn of the danger of failing to reduce emissions as fast as possible. -1: It would take me quite some time to collect all the evidence to demonstrate this; time I’d rather not spend at the moment. Inquiry into the evidence of a doctrine is not to be made once for all, and then taken as finally settled. It is never lawful to stifle a doubt; for either it can be honestly answered by means of the inquiry already made, or else it proves that the inquiry was not complete. “But,” says one, “I am a busy man; I have no time for the long course of study which would be necessary to make me in any degree a competent judge of certain questions, or even able to understand the nature of the arguments.” Then he should have no time to believe. Also, yawn at J. That’s what Professor Curry does. Censor and yawn; yawn and censor. I think it’s probably just a coincidence that she only reads my comments after periods when she hasn’t gotten much sleep. Well I originally found it by going to the CBC site a few months ago. But I refound it using google. My query was ‘CBC climate change Burke’. And do you think population is going to more than triple over the next century like the last or that food consumption per capita is going to increase as much over the next century then it did in the past century? But a doubling of methane levels isn’t an absolute increase but a relative increase. Because it suggests to the public that a loss of 23% will happen with certainty without mitigation, when in fact RCP 8.5 is highly unrealistic, let alone certain. I have made no such calculations. I plan to though because there are a few issues with Burke et al., but that is off topic. I do, it’s just that a lot of it is anecdotal and difficult to quantify, especially when I’m not keeping track of every misleading usage of RCP 8.5. You don’t even need a big science background. 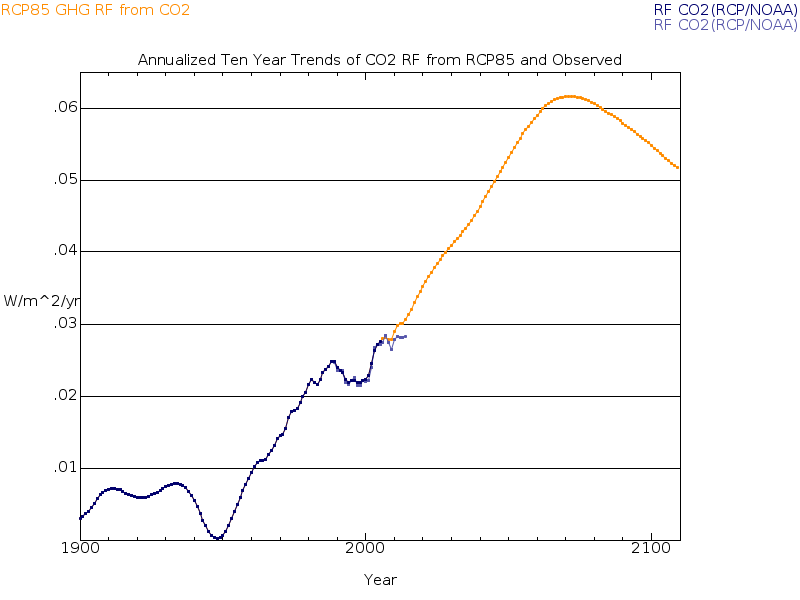 Just plot the real GDP to CO2 emissions ratio and compare historic trends to RCP 8.5. It’s not that there is an ‘error’ in RCP 8.5. It’s that RCP 8.5 isn’t a representative business as usual scenario and should be treated as such. Yet, that’s what people seem to be doing especially in the absence of a more reasonable business as usual scenario (but even if you did that, I expect that many would still try to portray RCP 8.5 as the BAU scenario because that helps ‘save the planet’). Yes, I think that both alarmism and denialism are a problem. It is much better to follow the evidence. What is the generally accepted meaning of that term? Usually by alarmist, I would refer to a person who is being irrational about the issue of climate change. Not it does not. That’s the point. Read it with your eyes open!!!!! We really cannot have this discussion if our understanding of basic language differs as much as it appears to do. We have to agree on the meaning of words like if and grow and current trajectory if this is to continue. I’m not convinced that we can. A. That pizza is poisonous, do not eat it. Isn’t that just another way of saying what is expected under business as usual (given that most countries are not mitigating)? So RCP 8.5 is not what is expected under business as usual. So when people describe RCP 8.5 as what will happen under ‘our current trajectory’ then they are saying things that are misleading and/or false. No it’s not. They described their study entirely reasonably and you’re accusing them of being misleading. Our current trajectory is RCP8.5. They explicitly descibed what their study suggested would happen if emissions continue to grow along our current trajectory. As far as I’m concerned, describing this as misleading is utterly bizarre. Given that I appear to have been correct that we can’t even agree of the meaning of basic words, I have no interest in continuing this discussion. We can’t have a discussion like this if we don’t even agree on something this basic. > I have made no such calculations. I plan to though because there are a few issues with Burke et al., but that is off topic. Since your incredulity is based on these calculations and these issues, I’m not sure how you can dismiss it as “off topic.” Speaking of topicality, your rope-a-dope is becoming tedious. In this case, the rope-a-dope consists in one proof by assertion after the next followed by a series of dodges. I have no idea if they intended to be misleading or not. Likely they had no such intention. Okay, according to your definition, is current trajectory the same thing as RCP 8.5? If so, could you please explain why? If your answer is ‘yes, because it is a BAU scenario’, well there are many BAU scenarios, so couldn’t those also be described as current trajectory (in which case there is no unique ‘current trajectory’ so you shouldn’t be able to conclude what will happen under the current trajectory). ??? My comment was with respect to a question you asked earlier about “expected global losses are approximately linear in global mean temperature”. As I haven’t done a regression study measuring the productivity effects of temperature, I have not made calculations to validate or refute the results of Burke et al. But that has nothing to do with RCP 8.5 being realistic or not. I think I’m reaching a conclusion similar to Anders’ as to whether we can go anywhere with this discussion. I said that you don’t have evidence on which to base certain (meaning sure, high-confidence)…and you said that you do: anecdotal and unquantified evidence. In my book, anecdotal and unquantified evidence isn’t sufficient for drawing certain conclusions. Perhaps you thought I meant “certain” in the sense of “specific, but not explicitly stated?” At least I hope so. And BTW – I would still like to know that that search query was if you used The Google to find that CBC article. > [T]hat has nothing to do with RCP 8.5 being realistic or not. Of course it does, Minus One. Think. I’m not sure how this relates to any claim made by the authors of the article you cited yourself, Minus One. … I told you a few posts earlier. ‘CBC climate change Burke’. If people claim that something is expected when it isn’t then that is misleading. It had a similar logical form as the claim made in the abstract of the Burke et al. paper (If X then Y will occur). In one case X is ‘current trajectory’ and Y is RCP 8.5 and in another case X is eat pizza and Y is die from poison. I’m on holiday and I really do have better things to do while on holiday than go around in circles about this. If the figure I included in the post is insufficient to convince you that our current trajectory is RCP8.5, then nothing I say will make any difference. If the words continue to grow is insufficient to convince you that they meant something like RCP8.5, then nothing I say will make you change your mind. I’ll repeat my point again, though. As long as people describe what they do in a reasonable way, then I think we should engage with what they’re trying to say. In this case they described a pathway in which CO2 continues to grow along our current trajectory. I think that’s a reasonble way to describe an RCP8.5 pathway. If you think it’s not and that it’s misleading then we have nothing further to discuss. @ ATTP – fair enough. I hope eventually you come to realize that the position of myself and others is the correct one regarding RCP 8.5, but I can understand if arguing over this is an unproductive use of time. It’s not that there is an ‘error’ in RCP 8.5. It’s that RCP 8.5 isn’t a representative business as usual scenario and should be treated as such. This fixation on a plateau forcing of 8.5Wm-2 is trivially beside the point: even a trajectory leading to half that is dangerous, as I noted three days ago. Pedantry about whether RPC 8.5 is equivalent to business as usual is a distraction from a much more serious issue. This is an excursion deep into logical fallacy territory. Pachauri’s words are reflective of his cultural background, and you have not established that they are simply not his use of a metaphor that is appropriate to this background. Further, even if he means the words literally as a Westerner would understand it, you haven’t established that his scientific understanding of the gravity of the issue has been compromised by his philosophical and ethical perspectives. One should not conflate the mechanism of an understanding with the nature of the response to it. Given that Pachauri’s conclusions are directly indicative of the conclusions of the overwhelming majority of the world’s experts in the disciplines related to global warming and its sequelæ, his words would appear to hold an appropriate moral response to the nature of the problem. Perhaps that is my dharma, in all the subtle contexts that pertain to the word. Thanks for providing that link. Sorry I missed it earlier. In a scenario of unmitigated climate change, the team’s model shows that by 2100 the per-capita incomes of 77 percent of countries in the world would fall relative to current levels. By the team’s main estimate, global incomes could decline 23 percent by 2100, relative to a world without climate change. So, comparing my quote – with the clause in bold – to the quote that you provided that leaves that part out, provides some pretty important context, IMO. Another implication is that due to a lack of due skeptical diligence on your part, you were being misleading in your characterization of the study. And I was going to say something about your Pachauri quote, about how it was likely used in a misleading way, but I see that Bernard has already made the case (much better than I would). > Look, the word expected [value] has meaning. […] If people claim that something is expected when it isn’t then that is misleading. > It had a similar logical form as the claim made in the abstract of the Burke et al. paper (If X then Y will occur). Neither X nor Y represent the same kind of variable. It’s not even the same kind of statement. For starters, “if you eat pizza” applies to one individual, whence “if we dump CO2 like there’s no tomorrow and we can’t rely on a Gnomic GRRROWTH Gimmick” refers to a collective action. One of the points of the article is to show that the “we” is indeed separable: few will win (a little or a lot), many will lose (a lot or a little). Also, the “you will die” is certainly not the same kind of predicate as “we will reduce our BMI by 23%.” The first appears in a categorical statement, the other in a statistical one. So no, the two claims don’t even have the same logical form, and the meaning of “expected value” should be enough to make you see why. Portraying the consequent of a statistical claim with “you will die” may not be the best way to raise concerns about misleading behavior, Minus One. It may not suffice to make you lose this ClimateBall ™ episode (everybody wins all the time), but it sure is enough to make you lose a lot. Anything’s possible, I guess. However, given that my current view is that your position appears inconsistent, is based on, at best, a rigid (but possibly incorrect) interpretation of what others have said, and is – consiciously or unconsiciously – an attempt to control the narrative by de-legitimising some terminology, it would seem unlikely. , but I can understand if arguing over this is an unproductive use of time. Ah. No. Oil and gas is mostly the wild west and a lot of guys guessing. I have a patent on measuring GHGs, and for the most part the industry has no clue what its doing. The very first text book in my field of work came out this year. 50 years late. I’m currently patenting my work in drilling ’cause everyone’s been doing it wrong all this time. Don’t for a moment fall into the belief that a bunch of super geniuses make oil and gas work. Joshua: There have always been studies show benefits to northern climates like Canada’s. I have my doubts however since the soil here is crap. Utter crap. Warmer, and hopefully moister soil is warm wet crappy soil. All studies ignore the long term impacts of sea level rise, and the fact there we’ll need to move coastal cities. The same studies also show the US and a Europe getting screwed. I guess they wanna grow sand? I still have my doubts. Soil here is crap. It could be both. For example, a Creation scientist may believe that the Earth is 6000 years old as both a matter of faith (cause the bible says so) and because they are convinced that the science indicates the Earth is 6000 years old. Everyone uses anecdotal evidence to some extent otherwise life is impossible. For example, if you walk down a street every week and get mugged a few times, eventually you might form the opinion that this street is dangerous and avoid it. Yet your experience is andecdotal and you haven’t done a scientific study to prove that street is dangerous. RCP 8.5 is absurd, unrealistic and unexpected. Does that clarify things for you? That’s irrelevant. X and Y just have to be clauses. Yes. This is one of the issues with Burke et al.. Another issue is that polar regions have less sunlight, so ignoring Sunlight may make the estimate of ~13 C for the optimal temperature for productivity be an underestimate. There are studies that try to estimate the impacts of climate change, but generally you can’t use a Richardian approach to do this. With respect to moving coastal cities, that is highly debatable. Given the slow level of sea level rise (0.5 m per century), you could just build sea walls like the Dutch do. Contrarians don’t listen to ecologists. If they did, they would understand the point you have twice made here: it is not the absolute magnitude of the temperature change that does the damage, it is the rapidity of the change. And *that* is what makes anthro warming so dangerous. It is fast. As soon as organisms’ ability to adapt is outpaced, extinction opens its jaws: food webs begin to tatter and fail and the depauperation of ecosystems begins in earnest. They explicitly descibed what their study suggested would happen if emissions continue to grow along our current trajectory. I wonder how rolling back renewable subsidies and laws related to reducing CO2 emissions at the same promoting the use of more fossil fuels would affect our current trajectory. > RCP 8.5 is absurd, unrealistic and unexpected. This claim rests on three separate arguments. The “unexpected” bit would require a proof that the authors you criticize get an expected value that would be incorrect. That implies redoing their calculations and getting another expected value. The “realistic” bit would require a plausibility argument. The argument would need to imply that “future adaptation mimics past adaptation” is unrealistic. The “absurd” bit would require a logical argument. I don’t think I need to spell that one for you, Minus One. > That’s irrelevant. X and Y just have to be clauses. Actually, it is relevant. Statistical inference is not deductive. Also, the “but alarmist” you’re trying to peddle does not rest on form alone. So you need to analyze the “will” in “if we dump CO2 like there’s no tomorrow and we can’t rely on a Gnomic GRRROWTH Gimmick, the average global incomes will be reduced roughly 23% by 2100.” You also need to analyze the kind of apparatus on which this kind of claim rests. This should be enough to show that the pizza example was just a caricature. Next time you come over, please bring a real argument. Patrick Moore has an ecology background and he is arguably a contrarian. I would like to see evidence of this strong claim. Diurnal and Seasonal temperature chances are far higher and many species migrate from location to location. What is expected under BAU is not RCP 8.5, but something between RCP 8.5 and RCP 6.0. RCP 8.5 is well outside of a reasonable confidence interval of what will happen based on the past. Looking at the trend of real GDP to CO2 emissions alone show that this is the case. I can obtain a p-value for you if you want. I’m using it as a synonym for realistic. RCP8.5 is absurd and ridiculous and it is misleading to describe it as representing ‘BAU’. It is a simple linear extrapolation of present emissions with a reduction (unexplained) in a few decades. But that is not what recent history shows. Emissions increased along with population since the 1950s, so that at present there are around 8billion people and emissions are a little under 40billions tons of CO2. But the historical pattern is asymmetric. The countries that first industrialised, expanded their population and started using fossil fuel in large quantities did so relatively slowly in comparison to the emerging nations – the BRICs – who are making the change from a largely rural agricultural poor population to one in which most are urban and commercial. Literate, with some government provision of infrastructure education and welfare. Most of the growing global population now can at least read about the way the rich live and at least aspire to be middle class. And on the historical evidence, the trajectory the world is on would indicate that is a reasonable expectation over the next few decades. But it will involve the 11billion people by 2100 using something equivalent to a modest ‘rich’ country today. If that many people, or even the present population use energy at the rate used, not in an outlier like the US or Australia, but in a median nation like New Zealand or France (given its efforts to decarbonise its energy generation) then world emissions will be at least double if BAU is followed and that energy is generated by burning fossil fuels. The objection may be made that it is physically impossible to extract and use that much fossil fuel. But the reserves, especially of coal exist. And I do not underestimate the ingenuity of oilman and his industry to develop ways to exploit every last drop and chip. It seems more likely that technological development will be easier in a mature industry than the radical change required in the existing energy generation systems to use renewable sources. Absolute statsis of fossil fuel use implies no technical advances in the field at all. an unlikely outcome on the historical evidence/ (fracking, shale, tarsands) Only political regulation is otherwise capable of constraining fossil fuel use to meet the energy demands of the global population emerging from subsistence farming and poverty. This makes RCP8.5 a woefull underestimate of what the future population will require to meet historical patterns of an increasing standard of living for an increasing population at an increasing rate. A simple calculation of CO2 emissions per person with the value that is required to supply the rising majority of the global population shows that the RCP8.5 emissions would be exceeded by around double the estimate within a few decades. > Everyone uses anecdotal evidence to some extent otherwise life is impossible. Some people take the issue of climate change religiously. > It is a simple linear extrapolation of present emissions with a reduction (unexplained) in a few decades. > Absolute statsis of fossil fuel use implies no technical advances in the field at all. 8.5 does not assume absolute stasis, BTW. I’m not sure it rests on the most recent estimates on the total reserves of fossil fuels, e.g. if it adds methane clathrates. According to James (pers. comm. ), that’s the elephant in the room that can get us above 900 ppm without any modelling effort. Sorry. I meant changes instead of chances. It isn’t that simple and a linear extrapolation isn’t always expected. If I throw a ball upward, does it make sense to linear extrapolate where that ball will be in the future based on the first second of movement, or would it make more sense to take gravity into account? Look, in 1970 CO2 emissions were 4.053 GtC/year and population was 3.691 billion (this is a sensible start year because this was went the clear air act was passed in the US and people started caring about smog). In 2010 CO2 emissions were 9.167 GtC/year and population was 6.866 billion. The change in CO2 emissions per capita grew roughly exponentially at a rate of about 0.49% per year (both real GDP / CO2 emissions and real GDP per capita grew exponentially). If we extrapolate this trend to 2100 and assume RCP’s prediction of 12 billion people in 2100 you get 24.9 GtC/year, which is less than RCP 8.5 and that would require global GDP per capita to grow at the same rate as the past 40 years (which is unlikely because rich countries only grow at about 2% per year and poor countries are catching up to rich countries). Yes, and RCP 8.5 more than doubles CO2 emissions. Plus you have the issue of insane methane emissions. > What is expected under BAU is not RCP 8.5, but something between RCP 8.5 and RCP 6.0. This usage of “what is expected under BAU” fumbles the ball, Minus One. Five of those six IS92 scenarios were business-as-usual scenarios, assuming no new control measures to counteract climate change. They varied mainly in their assumptions regarding population growth, cheap fossil fuel availability, economic growth, and technological changes. Two were higher than the central IS92a scenario, while two were lower. The sixth, IS92b, assumed that countries would follow through on their pledges to reduce greenhouse gases. Scenarios are “what if” based: there’s a left part with assumptions, and the right part with projections. The authors you cited clearly identified what they did was conditional on “if future adaptation mimics past adaptation.” You can argue all you want that this scenario is less plausible than another one where mitigation gets online, but you need to accept that “mimics past adaptation” represents quite well what “business as usual” may mean. You then switch back to another meaning of “expected.” What’s expected under RCP 8.5 is just not what’s expected under RCP 6. The statistical meaning of “expected value” is internal to the model under consideration. The expected value of a D6 is 3.5; the expected value of a D6 where you add 1 for some reason is 4.5; refer to D&D players for more on that kind of usage. So now it’s “reasonable.” Switching to the epistemic mode. Begging a question the IPCC rejects along the way. > I’m using it [“absurd”] as a synonym for realistic. Which means you were misleading all along. Not everything that sounds implausible is absurd, BTW. Or the other way around. Take this ClimateBall ™ exchange. I’ve asked you to stop rope-a-doping, and now you’re sniping, which is like rope-a-doping, but faster. No, but there is such a thing as what is expected under BAU. And if Burke et al. merely said that their result is what is expected under RCP 8.5 rather than what is expected under unmitigated warming then I would have no issue with it. Mimics past adaptation doesn’t result in a doubling of methane levels by 2100 as is the case for RCP 8.5. -1, I can only conclude that you are not engaging in good faith. Your response was a non-sequtur. Of course everyone weighs probabilities on the basis of anecdotal and unquantified evidence. > Mimics past adaptation doesn’t result in a doubling of methane levels by 2100 as is the case for RCP 8.5. “Doesn’t” sounds quite certain. Talking with so much certitude about future adaptation may look misleading. Minimizing impacts like that indicates lukewarm peddling more than rational argumentation. Rope-a-doping to “but methane” is duly noted, however. > No [there’s not “one” BAU], but there is such a thing as what is expected under BAU. Since there’s not “one” BAU, there’s nothing to which you can refer as “what is expected under BAU” simpliciter, because “expected under BAU” depends upon the BAU under consideration. It’s a trivial point, Minus One, and I think you’ve reached the end of this rope-a-dope. So, it’s somewhere between RCP8.5 and RCP6 (according to you) and yet you think it’s misleading to describe RCP8.5 as a BAU pathway? IMO, you’ve just provided a perfectly good argument as to why it’s entirely reasonable to describe it as a BAU pathway. I’m not hugely interested in taking this any further, but consider the following. BAU does not mean what we expect to happen. BAU, in this context, is what we would expect to happen if we carry on as we have in the past. Hence there is a difference between what is likely and what we might describe as a BAU pathway. This is intentional given that the general view is that a BAU pathway is one that we should probably avoid following. Hence it would be surprising if we did actually do so, given that much of the discussion about BAU pathways is aimed at avoiding it, not promoting it. The transcendental, imaginary and irrational one has put forward their concept of future emissions scenario into the ‘free market of ideas’ and the market here, (a predatory ecology) has established its value. Incorrect. You can obtain a probability distribution of BAU using empirical evidence and then take the expected value. It’s not misleading to describe it as a BAU pathway. But it is misleading to describe it as expected given no mitigation. I don’t think I agree, BAU is the no mitigation scenario (or maybe you could argue what would occur given the small amount of emission reductions pledged by developed countries). Since any model that tries to explain past observations will have uncertainty, there will be uncertainty as to what a BAU scenario would look like. You don’t need the word ‘expect’ to define BAU and I’m not sure the word expect is necessary. This is a value judgement. Demonstrating that BAU is undesirably is something that is not trivial. You appear to be changing your view, somewhat. You do realise that even RCP6 requires some form of mitigation? Okay, change it to “BAU, in this context, is what we might expect to happen if we carry on as we have in the past.” In other words, it is a plausible future pathway, given what we’ve done in the past. Patrick Moore is an industry shill and of no relevance here. When the environmental change outpaces organisms’ ability to adapt – which includes speed and range of migration – then what do you think happens? And please, no more nonsense about diurnal (or seasonal) change. They are transients and irrelevant to rapid climate change. trees are particularly good at this. BBD and Dikran have pre-empted my own reply, which would liley have been excessively long and meandering. > You can obtain a probability distribution of BAU using empirical evidence and then take the expected value. Then this expected value depends upon your assumptions. Just like what I said, and contrary to your “incorrect.” There’s no such thing as an expected value that stands alone. It needs to represent an “experiment” result, if I borrow the wording of the Wiki page you cited. Within their quasi-experimental setting, the authors you cited have an expected value about average global incomes. Their model does not exactly correspond to RCP 8.5, which means your “it describes RCP 8.5 as what is expected under no mitigation” wasn’t quite exact. This is not the first time I’m mentioning this, Minus One. In fact, this is not the first time you dodge most of the points I’m making. If you don’t get by now that I don’t forget the points I’m making, you’re about to discover it. According to the only graph I have seen posted in this thread (ATTPs and what appears to an updated version posted by Jos Hagelaars) we are currently tracking between 8.5 and 4.5 with us diverging from from 8.5 by a margin so slim you would need delicate Swiss instruments to notice it. To claim it is between 8.5 and 6 is like claiming that Los Angeles is somewhere between The Pacific and Atlantic oceans. Not untrue, but not exactly accurate either. You didn’t consider the possibility that by using the words “the general view” I was referring to people’s judgements? I don’t think there is really any way to definitively demonstrate that BAU is undesirable. All we can do is assess potential impacts and make judgements on the basis of those assessments. There are some, however, who seem to object to such assessments. > All we can do is assess potential impacts and make judgements on the basis of those assessments. I would imagine that BAU data is currently affected by current global economic woes more than anything else. Following up what I said before, I think the more we downplay or oppose the need to cut our greenhouse gas emissions the more likely we will follow the BAU path. It might be true that is unlikely we will follow the “skeptics” advice because we have some sense, but it is possible that there influence could grow and shape policy. Take the Republicans here in the US. I have seen very few acknowledge that we need mitigation measures or that we should reduce our fossil fuel emissions . In fact they support efforts to increase our dependency on fossil fuels (e.g. drill baby drill). They very well could shape policy given our country’s influence on the world and global emissions. RCP 6.0 is a concentration pathway, not an emissions pathway. And if we go by you view that the probability of the concentration pathway given an emissions pathway doesn’t matter, then all of the RCPs can be described as business as usual since it is possible to construct a business as usual scenario that leads to any concentration pathway (you just need enough flying spaghetti monsters to appear). So either we go with your approach that probability doesn’t matter, in which case all of the RCPs are BAU. Or we go with my approach, where probability does matter, in which case none of the RCPs are representative of BAU. Have you done a poll or something to measure the average person’s value judgement? Please demonstrate that the expected environmental change exceeds an organisms’ ability to adapt or migrate. Indeed. For example, trees have migrated quite a bit since the LGM. All predictions depend on assumptions. For example, when people send satellites into orbit they generally assume that the gravitational constant remains constant over time. What matters is are the assumptions reasonable. RCP is a concentration pathway. If they are following the concentration pathway of RCP 8.5, then the result isn’t what is expected under BAU. The fact that they use a separate model to predict future incomes does not change this. There are an infinite number of concentration pathways. I could construct an emission pathway that is roughly RCP 8.5 for the first two decades and then follows RCP 2.6 for the decades after that. Merely constructing four out of infinite many concentration pathways and pointing out that for the first few years CO2 emissions more closely resemble one of them does not indicate anything about the likeliness of following it. Now maybe if the concentration pathways were actually representative, that would be another story. But RCP 8.5 is most certainly not representative of BAU. RCP 6.0 is a concentration pathway, not an emissions pathway. Yes, I know it’s a concentration pathway. Did you even bother reading the post? What are you talking about? I pointed out the issue with relating emission pathways to concentration pathways in the post. If you can’t bother reading what others have said, then you’re wasting everyone’s time. To be quite honest, this discussion has gone the same route as I think our previous one went. Your complete confidence in your own views makes you someone I regard as not worth engaging with. Can you take your absolute certainty, your hubris, and your inabaility to engage with what others are saying, somewhere else? Please. Yes, that is what all the other squiggly likes on the graph are. We are not locked into a path that follows RCP 8.5 obviously but we are currently following something close to it. The longer we stay on that course the harder it is to change direction. I feel like you are having a different conversation from the rest of us. This statement seems to suggest that the future will prove or disprove 8.5. Huh? It’s a scenario and, as such, only represents—at this moment—a currently feasible path which might, or might not, occur. In other words, scenarios are ephemeral and only relevant up to the moment they’re redundant. And that moment will be the point in the future when new scenarios are published that reflect the state of the world, and the possibilities as they are, at that new starting point. All of which means that none of the scenarios can be wrong; but, at this moment, all of them can be useful. There’s lots of examples here. Read the literature. Mountain Pine Beetles have had a devastating impact in Western Canada, resulting in mill towns literally shutting down. Note the species adaptation required is vegetation, which in this case means replacement with species hardy to the Pine Beetle. Humans have adapted by being financially liquidated and becoming refugees, competing for jobs elsewhere. Salmon on the West Coast will also not adapt, and they don’t like warm water. For example, trees have migrated quite a bit since the LGM. Well yes … ’twas just a blink of an eye ago, that. Actually, one could view 8.5 as an optimistic scenario. You have close to 3 billion Indians and Chinese aspiring to all live like Americans. You have Africa nearing takeoff, and you have population curves exceeding even the most pessimistic projections of a decade ago. What is more, if we get serious about climate change, that might result in a decade or two of even greater increases in CO2 emissions as we build the necessary new infrastructure. Never underestimate the ability of humans to screw the pooch. Has no one bothered to actually cite what the IPCC says? “business-as-usual” baseline case, which assumes that future development trends follow those of the past and no changes in policies will take place..
> Has no one bothered to actually cite what the IPCC says? Of course not. Things take time. Minus One is still under the impression that the scenarios are predictive. Sometimes it’s better to keep a full hand. When dealing with parsomatics, it’s essential. So far, it sufficed to cite NG, to read the first paragraph of a Wiki page, and to look beyond one sentence in the abstract from a study that had some ice time at CBC. Thank you for citing it, oneillsinwisconsin. > So far, it sufficed to cite NG, to read the first paragraph of a Wiki page, and to look beyond one sentence in the abstract from a study that had some ice time at CBC. Perhaps I should clarify why I only used these sources. The first was NG’s reference for the Auditor’s (i.e. Fabius Maximus) editorial at Judy’s. The Wiki page has been cited by Minus One, just like the study featured by CBC. It’s harder for ClimateBall ™ players to rope-a-dope when the citations are restricted to the ones they themselves cite. Citing the IPCC report could lead to another round of rope-a-dope. It’s a big document, and the number of concerns that can be issued can become infinite. Yet another reason why audits never end. Mod: Let’s keep it polite. The trees didn’t migrate, they are (rather literally) rooted to the spot. Given sufficient time, they can however populate new areas and die off in others. The temperature change since the LGM has been rather gradual, giving time for this process, but trees cannot respond to temperature changes on the timescale of a few decades and I suspect you know that perfectly well. Indeed. Another example of why I concluded that s/he wasn’t engaging in good faith. Another was when s/he responded to my question with a completely irrelevant answer. The whole diurnal and seasonal change thingy, also. I can’t parse the more technical discussions, but can only assume a similar lack of good faith exists there as well. Seems to me, that to be able to perform good analysis, you have to be able to take counterarguments in good faith and refute them To refute them by mischaracterizing them and then arguing against a mischaracterization, or by ignoring them by addressing irrelevancies and not the actual counterargument, suggests poor faith. If it happens once or twice it could just be a mistake or the tendency we all have to avoid inconvenient counterarguments. But when it happens repeatedly….becomes a pattern….we…..
dikranmarsupial, tree-planting could be used to help some species shift poleward or to higher elevations if warming and precipitation patterns change more rapidly than natural dispersion methods can keep up with. Despite being familiar with the extensive amount of tree-planting already happening for species of commercial interest this wasn’t something that had occurred to me before reading the proposal (I can’t recall where). It’s hardly a panacea, but maybe a thin ray of hope. It seems as though there are some who argue that because things will probably change, it’s misleading to discuss what would happen if they didn’t. I meant to say thanks for that comment. Seems to me that the IPCC has defined BAU pretty clearly. 1. Appeal to motive fallacy. This is one of the main reasons why discussion is difficult here. You guys project some sort of evil hidden intent on those with differing opinions even where there is none. 2. I’m atheist. I don’t have any faith. 3. s/he is an agenderphobic microaggression. I think you may be missing (intentionally?) Joshua’s point. I can’t be bothered explaining it. BAU means nothing changes. If we look at current emissions, they are following RCP 8.5. I’m not even going to bother responding. I used to think you could do better. I don’t anymore. … even when they tacitly acknowledge that it has in the past. Evil? You might have any number of “motivations” behind not engaging in good faith. I have no idea which of those might be in play, and I certainly don’t assume that you’re any more “evil” than myself or anyone else here. But by repeatedly responding to my question with irrelevancies, you made a strong impression on me that you’re not engaging in good faith. Once or twice, fine. But you repeated the form of engagement. I wasn’t using the term in a legalistic manner – as in malice or desire to defruad – but in the sense of engaging to really have an shared discussion of perspective. What else explains why, repeatedly, when I asked about drawing certain conclusions based on anecdotal and unquantified evidence, you repeatedly “responded” but without actually addressing that point? You might have any number of “motivations” for not engaging in good faith – I would have no way of picking among them. The fact of your failure to discuss counterarguments on point says nothing about your “motivations” behind that failure. But let’s walk it back if my impression of bad faith is in error. Address my point rather than engage in irrelevancies (see below for an illustrative example of what I’m talking about)*. The same would apply to your comment about diurnal and seasonal temperature change. And your comment about trees migrating. I am not speaking to your motivations. This seems to be yet another example. It seems rather obvious to me that I wasn’t referring to religious faith there. So again, your response is irrelevant to the point that I was making. * So you’ve, seemingly, inadvertently laid out a very good example of what I was talking about. Based on probabilities I can guess that you’re male. But it would be foolish for me to draw a certain conclusion based on that probability, hence the gender-neutral pronoun. It is, indeed, ironic that you took offense at me trying to gauge my certainty based on the information provided. Just curious,since you seem to consider noting that you could be either female of male as a microagresion, which way is it aggressive, concluding that you might be female or concluding that you might be male? Good faith (Latin: bona fides) is fair and open dealing in human interactions. This is often thought to require sincere, honest intentions or belief, regardless of the outcome of an action. [Ad Hom, motive flavour] You have motivation M, therefore what you say is false. This is not what Joshua says, which is something like “you are showing bad faith, therefore I will end this discussion with you,” which is more than valid, and sometimes required (see below). If you wanted to illustrate Joshua’s point, you succeeded. Can you take your absolute certainty, your hubris, and your [inability] to engage with what others are saying, somewhere else? Please. I’m not fond of intention probing, and dislike tasteless ad homs. -1 If someone points out that one of the arguments you are making is specious and you reply in a way that is equally (and obviously) specious, it gives the impression that you are bullshitting (in the sense discussed by Harry Frankfurt. This is not intended as an ad-hom, just pointing out that if you want others to take your scientific position seriously, it is a good idea to take criticism of your own scientific position at least equally seriously, and not just attempt to fob your interlocutor off with and evasive, or obviously unsatisfactory replies. For instance “@ dikran – Indeed. For example, trees have migrated quite a bit since the LGM.” is an obviously specious answer, as the very slow “migration” of trees since the LGM does not imply that they can adapt over the very much shorter timescales of anthropogenic climate change, and it seems unlikely that you are not aware of this (as you appear not to be anything like that ill informed). Now you can if you like just respond to this with more “nature of the debate” arguments, however, it would be rather better if you could come up with a more reasonable scientific argument to suggest that tree populations will not be adversely affected (to a problematic extent) by anthropogenic climate change. In a theorical sense, perhaps, but since AT asked Minus One not to return, it might be best not to pull him back in. I think this discussion has indeed run its course and I can’t see much point in it continuing. From a scientific standpoint sure, but think of the entertainment value ATTP! Climateball is a wonderfully educational game that the whole family can enjoy. Well, at least someone found it amusing. I thought the parts about trees migrating, diurnal and seasonal temps, micro-aggression and atheism were all pretty funny – whether they were intended to be funny or not. Migrating trees are so sad. I always try to give a ride to any I see by the side of the road hitchhiking. Banana trees walk… Which is fortunate since since we have lots of room for them in Canada. It’s the triffids that one really has to watch for. Won’t someone think of the Ents? !